I love roses in different colors. 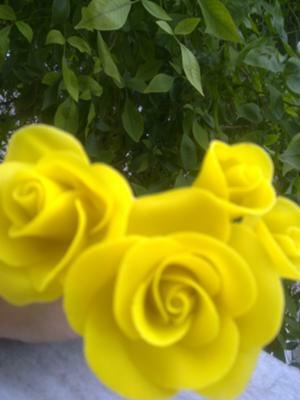 I found cold porcelain best (medium) to make flowers. Hey Sunita. Fantastic craft ability. How very beautiful. I love Roses and they are just beautiful. You did a great job. Beautiful. So life-like & delicate!!! i'ld like 2 see my hand made flowers on ur coffee table.Luv u for likin.U can catch me on face book and see my creations.I wish u will love them.Iwelcome ur comments there. It's really beutiful and creative. I wish had a talent like you Rose. 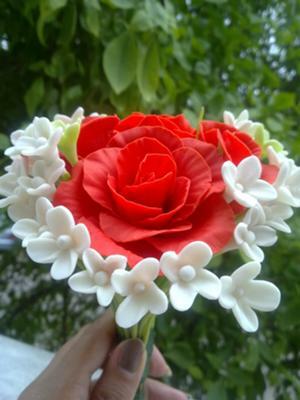 Malaysian woman especialy malays love to have an artificial flower for house decoration. Please share the knowledge with me. 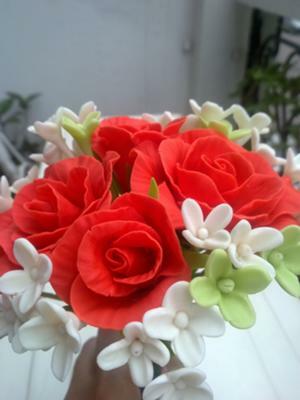 Thnx 4 appretiating.I love 2 make flowers especially of cold porcelain.Every time i try something new.I made daisies ,lillies,fillers etc.kindly visit http://sunita-sehdev.blogspot.com I wish u would like it.waiting. 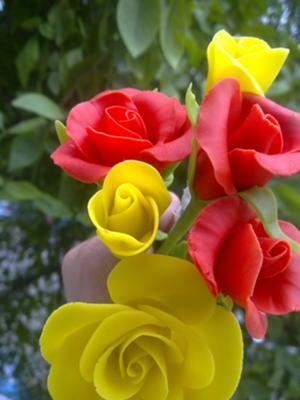 I try to make roses in different materials like foam sheets, clay, i didn't see anything like this.this is really superb. These are amazing! The roses especially are so life-like and I'm astonished by your technique. Now, I live across the street from a cemetery, and the artificial flower arrangements, which house all manner of insects and lizards, are constantly being torn apart by other animals, and I'm constantly trying to put them to rights, out of respect. However, one arrangement of porcelain roses has been there for YEARS and while it has gotten a bit grubby over time, the flowers still look pretty and the animals can't hurt them. Seriously, I'd love a bouquet of your flowers on my grave! Tho, I'm sure they'd look even better on my coffee table. Very good job. Well done. Your flowers are absolutely stunning - well done.